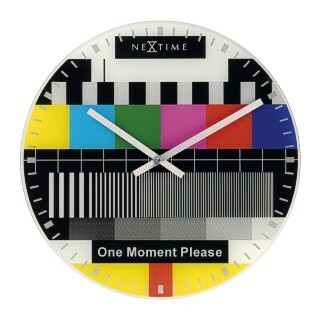 This bold clock with its depiction of an early colour TV test page has the words 'One Moment Please' and would make a great gift or addition to the home. It is 43cm in diameter (17 inches approximately) and offers great value for money as well as making a design statement. The polychromatic graphics are printed on a glass dial which has metal clock hands and bevel ground edges for a quality finish.